Is your dog underweight? Are you looking for a healthy way for your pet to put on a couple pounds? When we first adopted my dog she would not put on weight no matter how much we fed her and you could see her ribs for the first few weeks that we had her. This worried me, as it would any responsible dog owner, and I knew that I had to find the solution. I wanted her to gain weight but I didn’t want her to be unhealthy, so I set out to find the best dry dog food for weight gain for my sweet young dog. How To Tell If Your Dog Is Healthy Weight? The best way to tell if your dog is a healthy weight is by looking at their waist and ribs. If you can see your dog’s individual ribs they are likely underweight. Another way to tell if your dog is underweight is if your dog’s waist is noticeably narrower than its rib cage or if the incline between the dog’s rear and rib cage is too extreme. Alternatively if you place your hands on your dog’s side and you cannot feel their ribs than your dog is overweight. Other ways to tell if your dog is overweight are if your dog’s waist is in line or bulges out farther than your dog’s ribs. At a healthy weight you should be able to feel your dog’s ribs but not be able to see them each individually and from above your dog should be shaped similar to an hourglass. Check this article to help you decide if your dog has a healthy weight. While there can be many medical issues that might cause a dog to start losing weight, one reason can definitely be the choice of dog food. You have to pay attention to the calories in the dog food that you give your pet. Dog food that is described as “light”, “healthy weight”, or “reduced calorie” means that there are most likely fewer calories in your dog’s food than in a food that would be considered to be normal. Similar amounts of these lower calorie foods versus the normal foods can cause your dog to start seeing a weight drop. If your dog is losing weight all of a sudden and you have made no changes to their diets or exercise routines you will ABSOLUTELY want to get them checked out by a veterinarian. Possible health issues include parasites, cancer, kidney disease, advanced heart disease, dental disease, or stress. How Do I Get My Dog To Gain Weight And Muscle Mass? If you have decided to help your dog gain additional weight and muscle there are multiple things that you will have to do. It is not as simple as just giving them more or their food per day. One thing that can make a difference is the time of day you feed your dog. If you are trying to help your dog gain weight you will want to feed them a lighter meal in the morning and a larger meal in the evening. This will allow them to put on weight better since a dog’s metabolism, much like a human’s, is more likely to store fat than burn it during sleep. Another option would be smaller meals three to four times per day. It might seem counter-intuitive but additional exercise is important in the process of gaining weight for a dog. Exercise will help the dog to gain more muscle and this will ensure that the weight that your dog is gaining will be healthy. What Are Some Tips On Bulking Up Your Pooch Safely? After making sure that there is not an underlying medical issue that is influencing your dog’s weights there are some other things you will want to consider. As stated above you will still want to make sure your dog is exercising. This will help your dog’s weight gain be more about muscle than just packing on the pounds. In addition to food you can also give your pet treats. Peanut butter makes good treat of healthy fats for your pets and if they are anything like mine they will love it! Another thing to consider would be to make sure you are monitoring the weight gain of your pet consistently. Be sure you do not over-do it and have your furry friend become overweight. What To Consider When Buying The Best Dry Dog Food For Weight Gain? When you are looking for a food to help your dog gain healthy weight then the amount of calories you dog consumes really matter. You will want your dog food to have high caloric value with optimum nutritional value. Go for high protein to fat ratio when you are trying to bulk up your pup. Examples of proteins to look for are chicken, egg, beef, turkey, lamb, soybeans, or fish. Lamb is often a protein that is higher in fat and less lean than chicken or turkey. Examples of fats to look for are chicken or pork fat, cottonseed oil, vegetable oil, soybean oil, fish oil, etc. In addition to proteins and fats you can look for ingredients such as pumpkin or sweet potato. This will help to boost fat and fiber for your dog as well as being easy on your dog’s stomach. The amount of essential minerals and vitamins in dry dog food is critical for your dog’s growth. Check the nutrition label for quantity and types of vitamins included in food for your pup. Buy dry dog food that is free of artificial flavors, fillers, and preservatives. Go for all natural ingredients. Always buy dog food from a reputable brand. Pay special attention to any history of food recalls by a particular brand of dog food. 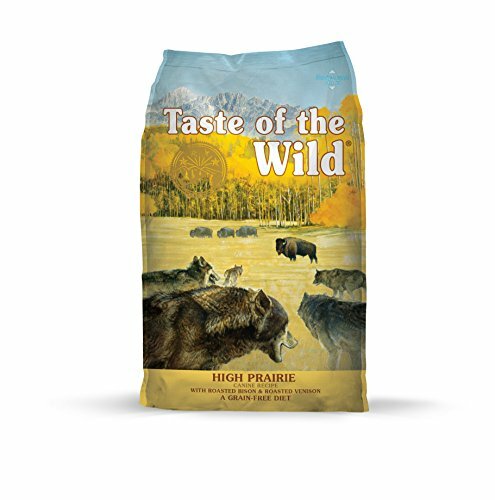 Taste of the Wild Grain Free High Prairie Dry Dog Food contains multiple ingredients that are linked to weight gain including buffalo, lamb meal, sweet potatoes, canola oil, and egg. There are also quite a few natural proteins included such as chicken meal, roasted bison, roasted venison, and beef. This dog food contains probiotics, anti-oxidants, and omegas. This dog food does not contain grains like corn, rice, or similar fillers. This combination will keep your dog energetic and healthy while helping them to gain weight. The price of Taste of the Wild Prairie Dry Dog Food is about average for specialty dog food at approximately $50.00 for 30lbs. With this category of dog food it is going to be more expensive than the dog food that contains a lot of fillers and processed food that averages $20.00 to $30.00 for a similar sized bag. One noticeable issue that I noticed while researching this food was reports of dogs getting sick off of it all of a sudden. Certain batches have been causing issues for dogs that previously had no issue with the food. This suggests that each batch is not necessarily consistent. Blue Buffalo Life Protection Formula Dry Dog Food contains real chicken and sweet potato. It also contains anti-oxidants and vitamins that are good for your dog. One of the great things about Blue Buffalo is what it does not contain. Blue Buffalo does not contain byproducts. It also does not contain as many additives and is more natural than the average dog food. Another good thing about the Blue Buffalo brand is that they cater more specifically to your dog according to both age and size. This allows you to customize your diet according to your specific pet’s needs. 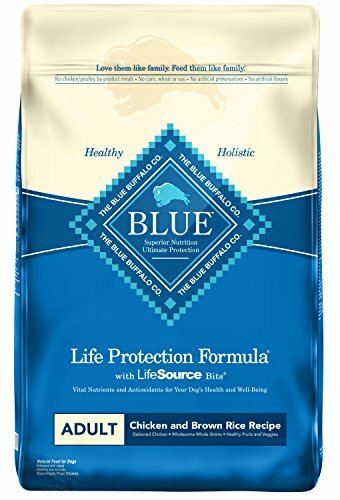 The price of Blue Buffalo Life Protection Formula Dry Dog Food is about average for specialty dog food at approximately $50.00 for 30lbs. With this category of dog food it is going to be more expensive than the dog food that contains a lot of fillers and processed food that averages $20.00 to $30.00 for a similar sized bag. One possible disadvantage to this dog food is that the only protein it contains is chicken. This is not necessarily bad, but chicken is a leaner meat meaning that your dog will be getting his or her fat from other ingredients. Another possible disadvantage to Blue Buffalo is that in the ingredients list it has chicken fats but does not list healthy fatty oils. The Purina Pro Plan Sport Formula Dry Dog Food contains real chicken, whole grains, egg, fish oil and other healthy fats and proteins. This dog food also contains amino acids and other healthy nutrients for your pets. One great benefit to Purina Pro Plan Sport is the level of customization options available. You can pick between different protein and grain options as well as activity levels. This will help tailor your dog food to fit your specific pet’s lifestyle. This will also allow a smooth transition when you no longer need a weight gaining formula for your pet. 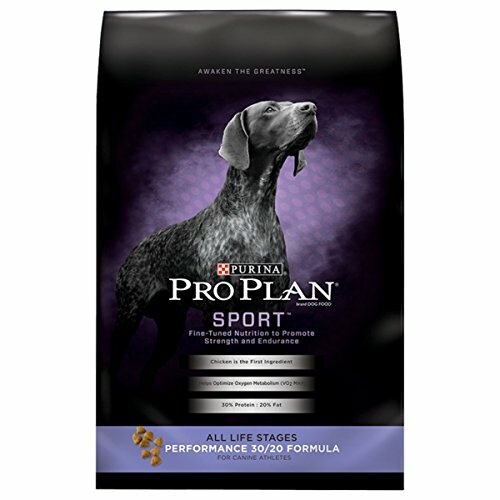 The price of Purina Pro Plan Sport Formula Dry Dog Food is more reasonable than some of the other listed options at approximately $50.00 for 37.5lbs. This allows you 7.5 more pounds for the same price as the Taste of the Wild or Blue Buffalo brands. Again this is still more expensive than the other non-specialty options. One potential disadvantage is that some options of this particular Sport formula contain corn and other grains. This means it has more fillers than some of the other options available. Purina Pro Sport does offer grain-free options but they cost a little more. 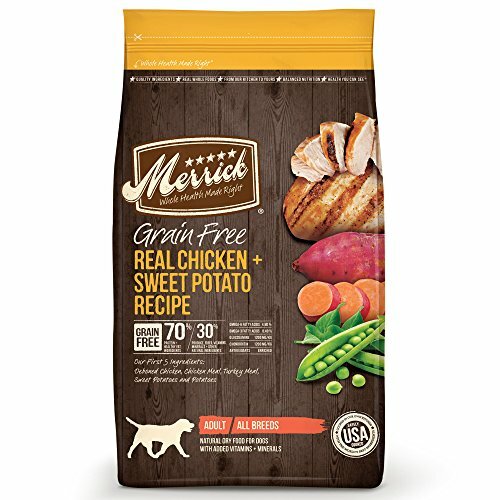 Merrick Grain Free Dry Dog Food contains real chicken, sweet potatoes, flaxseed oil, salmon oil, and other fruits vegetables and vitamins. This product does not contain grains or additives. Along with this the food contains healthy omegas and other essential vitamins and minerals. A grain-free formula means that your dog is getting the healthiest nutrients and will cause a healthy, lean, and muscular weight gain. The price of Merrick Grain Free Dry Dog Food is high at approximately $60.00 for 25lbs. This causes it to be the most expensive choice of the five options of specialty dog foods and almost double the average price of the non-specialty options. One thing that I wanted to see from this dog food at this high of a quality would be customization. When looking into other Merrick dog foods I did not see a different option for dogs of different sizes. As a knowledgeable dog owner I know that dog food designed with a dog’s size in mind allows dogs to get the options that are best for them and can help with joints or other issues, especially in larger breeds. 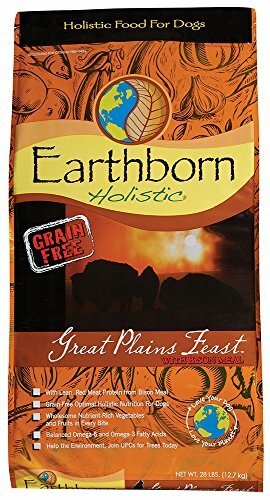 Earthborn Holistic Great Plains Feast Dry Dog Food contains real bison meat, eggs, canola oil, beef meal and other nutrient rich fruits and vegetables. It also contains omega, probiotics, and other healthy vitamins for your pet. This formula is also gluten and grain free. This food is high in proteins and vitamins which supports lean and healthy muscle growth. One possible issue with this particular brand is that it doesn’t seem to focus on healthy fats or weight gain. It is a high quality dog food with healthy ingredients but does not seem ideal if one of your goals for your pet is weight gain and not pure muscle growth and weight maintenance. Looking at all the options I know that I will be giving my furry family members Purina Pro Sport! Not only is it the most reasonable price for a higher quality of ingredients, but the main reason I have decided to go with Purina Pro is the multitude of options. It is simply the best dry dog food for weight gain. The other brands each had their advantages and disadvantages, but overall I think the quality was pretty standard across the board. I personally have two dogs of different ages and different activity levels and I know they each have different needs, so that’s why I will get them their own specialized Purina Pro Sport Dry Dog Food!